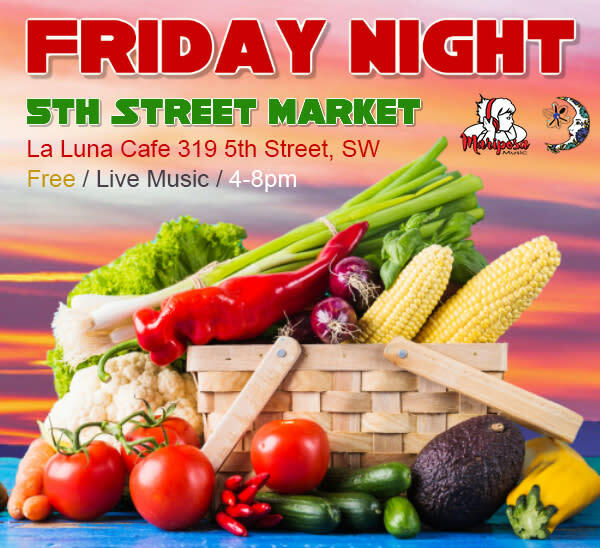 The Friday Night 5th Street Market features your favorite local growers, artisans, musicians in New Mexico’s newest Farmers Market. Enjoy your favorite adult beverages including local craft beer, and wine while you enjoy our indoor/outdoor market. Located on the grounds of La Luna Bakery & Cafe. Every week we will feature live music, courtesy of OE Solar, Healthy Food Discount Program, courtesy of La Luna Bakery & Cafe and our Education Station designed to keep the kiddos having fun while learning!! The Education Station is brought to you by ABQ Barkeeps! Due to our extensive network of top music acts such as Reviva, The Riddims and Keith Sanchez & the Moon Thieves, to mention a few, you can enjoy amazing music while you shop from your friends and neighbors and enjoy the beautiful Albuquerque Spring/Summer/Fall weather.